Less is definitely more with this beautiful 25cm onyx black trumpet vase. With a single, elegant sweeping swirl cut into its surface and three perfectly placed sparkling Swarovski Diamante crystals along the swirl, it will look stunning on a mantelpiece, table or in a display cabinet. 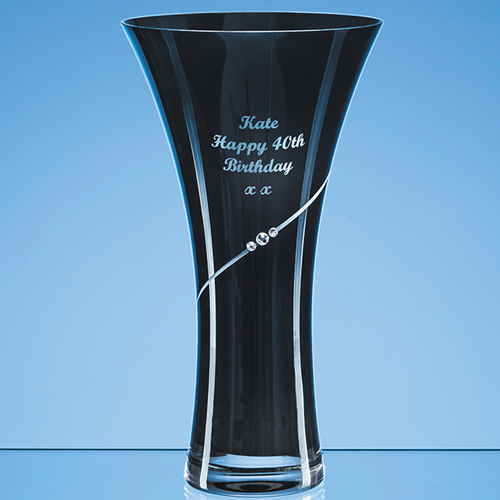 And with space to engrave an inscription or message, it would make a great work leaving gift or romantic present for someone special in your life. There is an optional satin lined presentation box available also, which would complete the look of this gift - ask about this when ordering.